The ongoing war in Syria has destroyed much of the country’s water infrastructure, leaving five million people suffering from a critical water shortage, said Unicef in a statement released on August 25. Unicef accused parties to the conflict for deliberately targeting the country's scarce water supply and using it as the weapon of war. In the northern city of Aleppo, the fight has reportedly “crippled” the main pumping station. As a result, the city has recorded around 18 deliberate cuts in the public water supply this year. Taps in some communities were left dry for up to a month. In recent weeks, water prices have increased in Aleppo by up to 3,000 per cent. The water crisis came at a time when families are finding it harder than ever to make ends meet and Syria faces an intense summer heat wave, recorded as worst of the decade. The disruption to piped water supplies has increased the risk of water-borne diseases, especially among children. The long-duration water cuts have forced families in Damascus, Dera’a, Aleppo, and other areas to “rely on dirty water from unregulated and unprotected groundwater sources, exposing children in particular to the risk of contracting diarrhoea, typhoid, hepatitis, and other diseases”, read the statement. According to Unicef, 2.3 million people in Aleppo, 2.5 million in Damacus and 250,000 people in Dera’a are suffering from water crisis. The water misery is particularly acute for millions of displaced families who have to share limited water supplies in over-crowded camps and shelters. Ongoing fighting and violence has severely damaged the water pipelines and other water infrastructure, but the municipal workers and engineers are unable to carry out the necessary repairs. The frequent power cuts further aggravate the crisis since water cannot be pumped out to the public. The war in Syria has worsened the water crisis, and water availability is about half of what it was before the crisis began in 2011, says the UN release. Water availability had decreased from 75 litres to 25 litres per person within just three years after the crisis, stated the UN report. 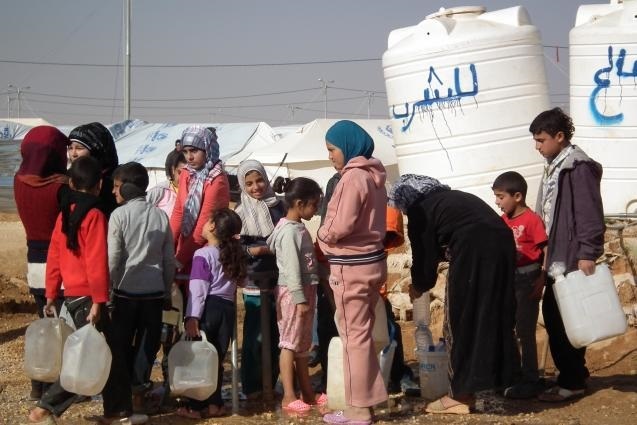 “Clean water is both a basic need and a fundamental right, in Syria as it is anywhere else,” said Peter Salama, Unicef Regional Director for the Middle East and North Africa. He demanded that “denying civilians access to water is a flagrant violation of the laws of war and must end”. One year since the ceasefire that ended the summer 2014 war on Gaza 120,000 people across the Gaza Strip are still disconnected from the water network and 23 per cent of the territory's population were not connected to the sanitation network said EWASH Advocacy Task Force and the Coastal Municipalities Water Utility in a joint statement. EWASH is a coalition of local and international organizations and UN agencies working on water and sanitation in the occupied Palestinian territory. Yemen has already been facing a severe scarcity of water for decades. But the civil war that began in March 2015 has destroyed water pipes, storage tanks and the pumping facilities, leaving the Arab nation water dry. The number of Yemenis who lack access to drinking water has almost doubled since the civil war began, according to a report by reliefweb, the United Nations agency. The global index of water stressed countries released this week. also reminds that regional violence and political conflicts has contributed to water stress in the least-water secure Middle East nations. It warns of extreme water challenges for the next 25 years and is a wake-up call for politicians and planners of the region.